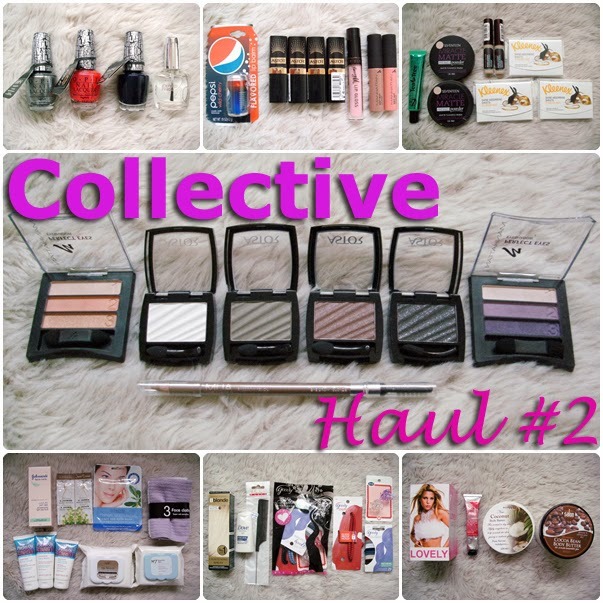 Here is my second collective makeup and beauty haul (you can see the first one here). The idea behind these posts is that I'll collect the past month or two's worth of beauty purchases and then I'll do a huge haul post showing you all the makeup and beauty products that I've purchased recently! I'm a bit of a bargain hunter so a lot of these items have come from discount retailers such as pound shops and bargain stores. I hope that these posts will demonstrate how much you can potentially get for your money if you are prepared to shop around for beauty products and visit some lesser known retailers of makeup and beauty products. Nails (OPI Silver Shatter, OPI Pink Shatter, OPI Navy Shatter and Maybelline Express Finish 40 Clear nail polish). I picked up another lip balm to add to my collection and this little Cherry Pepsi one is really super duper cute don't you think?! The four Astor Color Last VIP Lipsticks in the middle are really quite wonderful considering that they were only a mere 50p each! They actually came from Poundworld in little duo packs with a single Astor eyeshadow. I also picked up my first ever Barry M Wand Lip Gloss and two Manhattan Matte Lip Creams that also came in duo packs with a Manhattan eye shadow trio from Poundworld! Lips (Pepsi Wild Cherry Flavored Lip Balm, 4 x Astor Lipsticks, 1 x Barry M Wand Lip Gloss and 2 x Manhattan Matte Lip Creams). Astor Color Last VIP Lipsticks (L to R) in the shades 344 Classy Red, 126 Pink Obsession, 345 Provocative and 323 Beige Addiction. I picked up a few fairly 'essential' face products this month as you can see! The W7 Tea Tree Concealer is in the shade light medium and it is a little dark for my pale skin but it's still wearable, especially under foundation rather than over foundation. The Seventeen Miracle Matte Pressed Powder is something I have re-purchased for a long time because I do find it to be a good mattifying face powder. I picked up 2 Maybelline Pure Cover Mineral Concealers in the shade 2 natural which I actually really like but again they are a tiny bit darker than I would have preferred but this was the only shade that my Poundland had! I'm finding it easy to fix this by mixing a little foundation with my concealer and this has been working really well for me. The Kleenex Shine Absorbing Sheets are something I have loved and re-purchased for a while, so I was thrilled to pick them up for £0.29 when their retail price is usually £2.99. Sadly, I do think that this probably means they may have been discontinued, so I stocked up and purchased few to keep me gong for a while! Face ( W7 Tea Tree Concealer, Boots 17 Miracle Matte Pressed Powder x 2, Maybelline Pure Cover Mineral Concealer and Kleenex Shine Absorbing Sheets). Boots 17 Miracle Matte Pressed Powder x 2 in the Shade Ivory Porcelain £5.98 for both (buy one get one 1/2 price offer). The MUA Eyebrow Pencil in the shade Blonde is something that I have purchased before. It's quite a waxy formula and is very warm toned (so much so that it verges on being a little orange) but that is true of so many eye brow pencils including ones that cost a lot more than this. This does fill in eyebrows pretty well and I know people who totally love this pencil. Personally, I like to set it with a little eyebrow powder to make it look a little bit more matte and natural. The Manhattan Eyeshadow Trios are quite cute and came with the Manhattan matte lip creams making them a bargain at only 50p each. They can also be used wet or dry which makes them a little bit more interesting too! The Astor Single Eye Shadows are nice little additions to my eyeshadow collection and the shades are really quite on trend and fit nicely with this seasons dark winter shades. I haven't had chance to try them out properly yet but the pigmentation actually seems to be really decent and the formula seems creamy and easy to work with. Eyes (MUA Eye Brow Pencil in the Shade Blonde, Manhattan Perfect Eyes Eye Shadow Trio in the shade Brown Effects, Manhattan Perfect Eyes Eye Shadow Trio in the shade Falling for Purple, Astor Couture Eye Shadow in the Shade 800 Pearl, Astor Couture Eye Shadow in the Shade 310 Dark Green, Astor Couture Eye Shadow in the Shade 120 Cocoa and Astor Couture Eye Shadow in the Shade 720 Glam Black). Eyes (Manhattan Perfect Eyes Eye Shadow Trio in the shade Brown Effects, Manhattan Perfect Eyes Eye Shadow Trio in the shade Falling for Purple, Astor Couture Eye Shadow in the Shade 800 Pearl, Astor Couture Eye Shadow in the Shade 310 Dark Green, Astor Couture Eye Shadow in the Shade 120 Cocoa, Astor Couture Eye Shadow in the Shade 720 Glam Black and MUA Eye Brow Pencil in the Shade Blonde). Eyes (Manhattan Perfect Eyes Eye Shadow Trio in the shade Brown Effects, Astor Couture Eye Shadow in the Shade 800 Pearl, Astor Couture Eye Shadow in the Shade 310 Dark Green, Astor Couture Eye Shadow in the Shade 120 Cocoa, Astor Couture Eye Shadow in the Shade 720 Glam Black, Manhattan Perfect Eyes Eye Shadow Trio in the shade Falling for Purple and MUA Eye Brow Pencil in the Shade Blonde). I love a bit of skincare! I'm always looking for new face masks to try and feature in my face mask Friday reviews. I also keep a look out for skincare products that I think might be suitable for my combination/acne prone skin. I was really excited about the Creightons Perfectly Clear range as it contains salicylic acid which is great for controlling acne and the face wash and scrub are both non-foaming and don't contain any sulfates which means they're super gentle and non-drying. Generally, I start removing the bulk of my makeup at night with a wet wipe of some sort so I like to keep stocked up with face wipes or baby wipes. Facial Skincare ( Johnson's Oil Balancing Light Day Fluid, Face Food Gensing and Jasmine Sauna Face Masks x 2 6ml, Elements Spa Therapy Renewal Moisturizing Face and Neck Mask, 3 x Microfibre Face Cloths, Creightons Perfectly Clear Facial Scrub, Creightons Perfectly Clear Face Wash, Creightons Perfectly Clear Mattifying Moisturiser, Spa Premium 4 in 1 Cleansing Wipes with Ceramide and Boots No 7 Beautiful Skin Quick Thinking Face Wipes). Creightons Perfectly Clear Facial Scrub, Creightons Perfectly Clear Face Wash, Creightons Perfectly Clear Mattifying Moisturiser. I purchased the Jerome Russell Bblone hair lightening spray after a platinum blonde hair dye which promised to lighten hair up to 8 shades left my roots looking very orange! It was actually quite good and really helped to lighten up and even out my botched hair color. The Goody Hair Accessories packs were great value from Savers and I love the non slip hair bands in particular. Hair (Jerome Russell Bblonde Lightening Spray, Mini Dove Intense Repair Shampoo, Hair Works Fish Tail Comb, and 2 x bags of Goody Hair Accessories including headbands, hair elastics and butterfly clips). I got Wild Rose Hand cream from The Body Shop for free using a discount code from Voucher Codes. Derma V10 is a really good budget beauty brand and I love this Coconut body butter. In fact, I've been using it so much, about 2/3 of it has already gone now! Body Products ( Lovely Perfume, Body Shop Rose Hand Cream, Derma V10 Coconut Body Butter and Salon Creative Cocoa Bean Body Butter). So, that's my huge collective bargain makeup and Beauty Haul! I hope you liked it and please let me know if there is anything in particular here that you would like to see a full review on.